He gained quite an exhaustive experience in the management of varied Chest Diseases at GTB hospitals, Mumbai for 9 years before starting his own consulting practice at Navi Mumbai in 1996. His area of special interest has been Allergy and chest diseases like Asthma, COPD, Pneumonias, Pleurisy, TB, ILD (interstitial lung disease), etc. 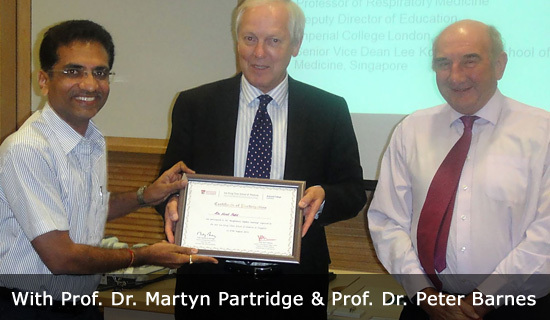 Apart from being a fellow member of different medical bodies, he was also awarded ‘Associate Fellow of Industrial Health’ by Ministry of labour, Govt. of India in 1996. With the rising prevalence of various respiratory ailments including asthma and allergy, a specialty clinic addressing this area was the need of the time and so he set up ‘Chest and Allergy Clinic’ at Navi Mumbai in 2005. Located at Vashi, the center is easily reachable from bus depot and railway station. The clinic is kept open from 09:00 AM to 08:00 PM (whole day) to conduct activities like patient education and training, prevention counseling, device demos, pulmonary rehab, Dr. Patil is available at the center Monday to Saturday between 01.00 PM to 08.00 PM.